I just received word that Brother Lockee is out of surgery. The Drs. said everything went well. He will be in the recovery room for about 90 minutes, then he will go back to ICU. Keep praying! We are trusting the Lord to move in this matter in a great way. It has been a while since I have had the time to sit down and write a blog post. Sorry about that. We have our meeting week before last and it went well. Brother Doug Bearden preached under the anointing of the Lord and God used him to help our church. Last week I attended the Bible Conference at West Lenoir Baptist Church here in Lenoir and I received much help in that meeting. Yesterday, I preached the funeral of a man of God name Doc McGuire. He was a faithful preacher of the Word of God and man God used greatly for His glory. Today, I want to give everyone and update on Brother James Lockee. Brother Lockee is in the hospital in Winston-Salem awaiting open heart surgery possibly on Friday to take care of a couple of blockages and to repair a faulty aortic valve. For updates regarding Brother Lockee’s condition, please visit this link: pastor.jameslockee.org. There is a guestbook you can sign there to let the Lockees know that you are standing with them through these difficult days. Please pray for Brother James, Sister Margaret and their son Charles. Pray also for Liledoun Baptist Church. Our winter meeting with Brother Doug Bearden has been a real blessing. Brother Doug is the Pastor of Central Baptist Church in Carrollton, GA and he is a truly anointed preacher of the Gospel. He had his wife Mrs. Gail have been with us all week. The preaching has been superior and each night Brother Doug has exalted our Savior. Last night he preached about the scourging our Lord endured the morning He was crucified. I have never heard such a vivid and powerful description of that terrible event. The Lord swept through the meeting and overwhelmed many with a sense of His love, mercy and grace. We wept, we shouted, we bowed before Him in worship. It was an awesome experience. I am looking forward to what the Lord has for us this evening. As usual, many of our own people have chosen to sit out the meeting. I do not understand that! It seems to me that if your church is providing an opportunity to hear the Word of God and to worship the Lord, you would be in your place. I suppose they are more consumed with their daily activities than they are with the Lord Himself. I suppose they would rather shop, watch TV, taxi their children here and there than go to church to meet the Lord in worship. I will not lie, it bothers me! I am interested in worship. I am interested in serving the Lord. I am interested in moving forward. And, I am interested in doing those things with a like minded people. Pray for the last night of the meeting. We need God to move among us once again! I woke up at 4:30 AM to find about 5-6 inches of global warming all over the place. 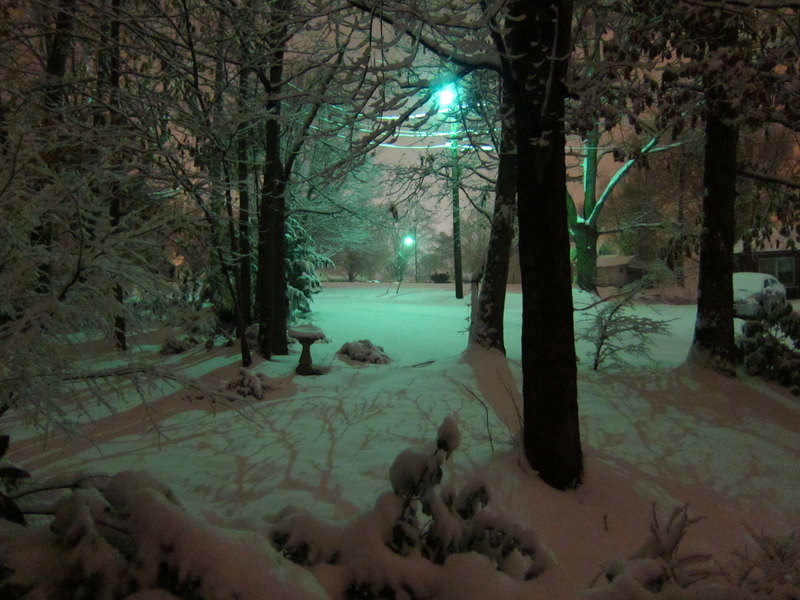 I thought I’d post a picture I took from my front door around 5:00 AM. Just thought I’d share. Please remember several of our people for prayer: Gary Brakefield and Doc McGuire are in the hospital. Becky Morrow passed away yesterday. Pray for her family. It seems I am not alone. I appreciate all the positive posts and E-mails I have received from my last post. It appears that whatever I am, many of you are too. It is good for me to know that I am in such exalted company. Of course, membership in this club does not come without its responsibilities. If you believe all the things I mentioned in my post, you are responsible for sharing those things (otherwise known as the Gospel) with a lost world. Instead of sitting around and trying to pick apart a man’s theology, it seems to me it would be more productive for us to actively engage in getting the Gospel to the world. We don’t have to cross every “t” and dot every “i” exactly alike for us to work together to tell the world about Jesus. So, thanks again for your words of encouragement. I am grateful for those who visit my humble web site and for those who take the time to opine. God bless you as you share Him with a world that desperately needs to hear the good news of salvation by grace alone, through faith alone in Christ alone!